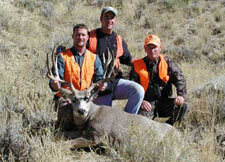 This deer was taken on the Powder River in Wyoming on the opening day of the 2003 season (just a couple of weeks ago). We were hunting on this property for the first time and at the crack of daylight we were seeing alot of decent bucks. The three of us had drawn #’s to see who would shoot first on the flight up from Alaska. I could not believe that I had the luck to draw the #1 shooting oportunity. As it worked out I also shot the smallest deer of the three hunters!!! 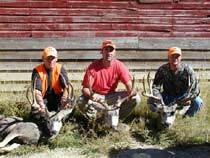 I have been mule deer hunting for a number of years and one of the other guys had been a couple of times himself, However the fine gentleman who took the large 9×6 in the photo HAD NEVER BEEN MULE DEER HUNTING!!!!! And it gets much worse!! 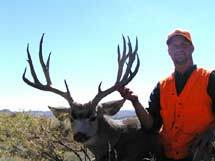 As soon as we had seen a decent buck, that I chose not to shoot, my friend (who had never been mule deer hunting) was jumping at the chance to shoot the one that I had passed on. We went to take a closer look and I confirmed my decision to pass on the deer and let the ROOKIE have a shot. He promply missed the buck after a small war of 5 shots had been fired. He was sure that he had hit the deer but the video camera did not lie and the deer lived for one more day. We had walked for about 20 minutes towards the truck and the ROOKIE realized that he had left his binoculars on top of the hill during the unproductive shot attempts. It was pretty tough walking and he pleaded for us to go back and help him find his binoculars. We told him that we had already wasted enough time fooling with an amateur that we had deer to kill we would pick him up in a few hours. He began to walk up the hill and that was the last we saw of him for a few hours. After we had a chance to cover a decent portion of the ranch glassing for deer and getting a decent lay of the land it was early in the afternoon we decided to go back and see if we could spot the ROOKIE. We spotted him a mile away and he was jumping up and down on top of a hill motioning for us to come and get him. BOY that was a long walk, we figured that he had better have something big down or he was going to be in trouble for having us walk all that way. Come to find out that he had gone back up the hill to get his binoculars and thought he would look for the deer he had shot at earlier JUST IN CASE THE VIDEO Was wrong. During this time he spotted this old bruiser and missed him the first three shots and finally killed him with the last two shots!!! what a first mulie!! !